Microscope Dentistry | Palo Alto, CA | Babak Mostaan, D.D.S. 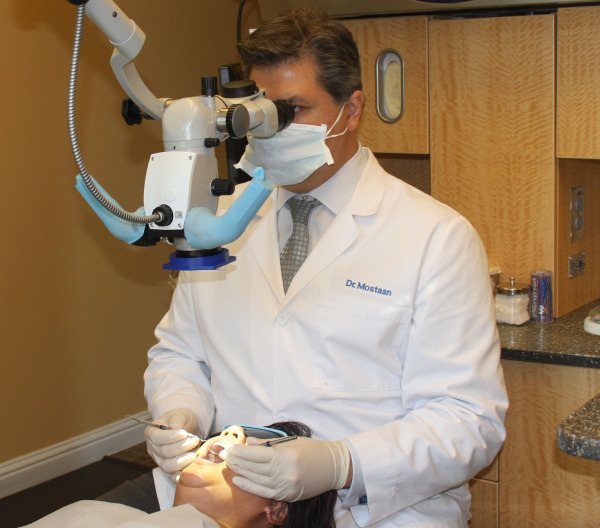 Dr. Mostaan is one the few dentists in the bay area who are practicing Microscope dentistry, utilizes advanced dental technology to enhance the quality and fit for your dental care. Our practice uses high power microscopes to enhance the precision of patient care. Surgical microscope technology makes minute details and fine structures clearly visible, enabling Dr. Mostaan to visualize high-contrast and natural images. Most important: better vision is the key to improving the quality of the examination and the treatment. Surgical microscope helps provide reliable identification of root surface and intra-bony defects upon removal of sub gingival plaque and calculus. Root fractures and related abnormalities are easier to detect and assess, as are abnormal soft tissue lesions of the gingiva, palate and mucosa. Even root canals are illuminated and imaged. Surgical microscope supports reliable detection and extraction of a proximal caries, enamel and dentine. It allows Dr. Mostaan to quickly visualize and carefully work around even the small areas of caries – including those located close to the pulp and nerves – to help prevent damage to the tooth‘s healthy tissue. It also can help facilitate the finishing and polishing of margins in crown preps and offers excellent visualization support to perform a range of prosthetic applications such as crown edges, veneers, resin fillings, inlays, on lays and composites. Surgical Microscopes help optimizing aesthetics while potentially minimizing patient discomfort and wound healing time. It also facilitates many implant therapies by making important details visible – for surgical as well as prosthetic procedures. Complications in sinus lift procedures can be avoided by a more controlled elevation of the mucosal membrane. Precision and ease are likely increased during most periodontal surgical procedures, for example, hemisection and root amputation procedures. OPMI Pico can help to reliably visualize vital anatomical structures during complex tooth extractions.